A simple blood pressure measurement can predict a heart failure patient's chance of recovery, a study suggests. A US team found low systolic blood pressure at the time of hospital admission was linked to higher death rates in heart patients. They said their findings could help to lead to more targeted treatments for these patients. Just under one million people in the UK currently have heart disease, and the figure is rising. 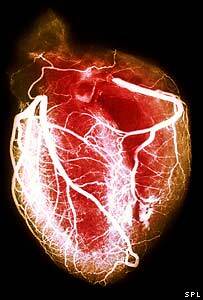 It occurs if the heart becomes less efficient at pumping blood around the body. It can be treated with a variety of drugs, such as ACE inhibitors, or surgery, but has a poor prognosis. To examine the association between systolic blood pressure and recovery, the researchers looked at 48,612 patients admitted to hospital for heart failure in US hospitals between 2003 and 2005.
systolic blood pressure shows the pressure in the arteries when the heart is forcing blood through them. Both are used in blood pressure readings, where 120/80mmHg - the optimum level - would mean a systolic pressure reading of 120mmHg (millimetres of mercury) over a diastolic pressure of 80mmHg. The researchers discovered that those with a low systolic pressure measurement, of less than 120mmHg, had a 7.2% risk of dying in hospital, compared to a 3.6% mortality risk in patients with normal systolic pressure (considered to be in the range of 120-139mmHg). Patients with very high systolic pressure, of over 161mmHg, had just a 1.7% risk of dying in hospital. The researchers also found the patients with high systolic pressure had a better chance of responding to treatment and a lower risk of dying in the 60 to 90 days after they had left hospital. They found diastolic pressure was not such a good indicator of mortality. More than 50% of the patients had a systolic rate higher than 140mmHg when they were admitted, and those with higher systolic blood pressure were more likely to be female and black. Dr Gregg Fonarow, lead researcher and director of the Ahmanson-UCLA Cardiomyopathy Center, said: "Systolic blood pressure taken at hospital admission was a strong independent predictor of mortality and morbidity in this large, representative heart failure patient population. "We hope the findings may help clinicians more effectively stratify risk and offer more targeted treatments based on a patient's systolic blood pressure level. "To optimise treatment, we may need to medically approach heart failure patients differently depending if their systolic blood pressures are normal, low or high." The scientists said they believed lower systolic blood pressure may indicate a more advanced version of the disease. They said clinical trials would reveal more about heart failure disease development. Ellen Mason, a cardiac nurse for the British Heart Foundation, said: "It is an interesting study, and often people admitted to hospital with acute heart failure do have low blood pressures. "I think the interesting thing is why people with higher blood pressure might fare better and how the processes going on in the body might be different. "But it is important to remember that this study looked at very sick heart failure patients - for most people having a normal or low blood pressure is better, high blood pressure can cause heart failure and all kinds of other problems."